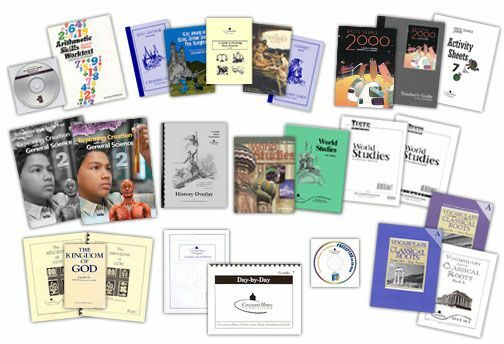 Seventh Grade Curriculum  - $617.00 : Covenant Home Curriculum - Providers of a complete, eclectic, classical approach, Pre-school through 12th grade curriculum for home educators with a reformed Christian world view., The World's Best Reformed, Comprehensive, Classical, Homeschool Curriculum, and School Administration Provider! Seventh grade is in every respect a time of transition. New, more serious preparations for life and service are encountered. The excellent Write Source 2000 program will guide your student through the process of learning to write effectively. Note-taking and outlining are promoted. Lessons in Etymology are continued with a new series of word studies in Latin and Greek roots. Unabridged classical literature is consistent with the period of history being studied. The Bible program, an in-depth Old Testament analysis of the Kingdom of God is provided in survey form with a test set, plus Scripture memorization. Students finish their study of the Old Testament in the eighth grade, or have the option of working in the Westminister Shorter Catechism, an excellent choice for older siblings as well. The history text and the CHC history overlay cover the period of the Middle Ages to the present. Exploring Creation with General Science is designed to be a student's first systematic introduction to the sciences. A transitional math text presents a complete review of all mathematics up to algebra. Saxon Math is also available at any level needed. Solutions Manual to General Science, 2nd ed.